Bisnow Venture's Trending 40 honored Washington's Top Tech CFOs on Thursday, September 24 at the offices of 1776 in Crystal City, Virginia. 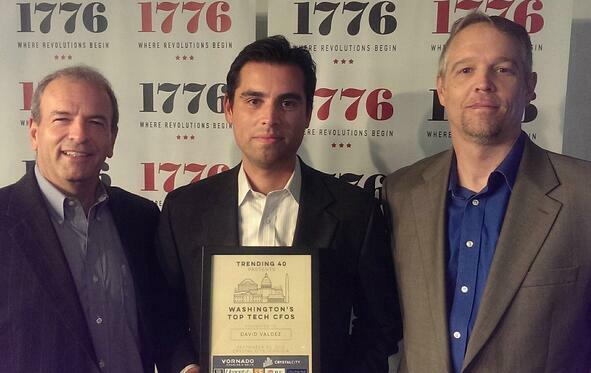 Privia's David Valdez was recognized among the great financial talent in the Washington region's tech and start-up community. In Bisnow's interview with David, he shared that his interest in accounting began with a professor who showed him the jobs section of a newspaper with a great number of openings in the field. Something that most people don't know about David is that he majored in graphic design, won a Gold Key award and had his artwork exhibited in the Corcoran Gallery. As CFO of Privia, David has been instrumental in raising two rounds of private equity and converting the financial business model from traditional enterprise software to software-as-a-service. He is currently focused on growing Privia’s sales and marketing initiatives through Hubspot. Pictured above with David are Privia CEO Glenn Giles and COO, Scott Hiles. See more photos from the event, here.